Each day at Odyssey looks different from the next. We believe that education should be about shaping students who learn to live and lead from the inside out. Our educational opportunities are different from any other school! They are crafted around questions of deep moral importance, real-world significance, and engaging learning experiences for sixth through twelfth grade students! Building community with those around you, each and every day. The unique educational environment at OLA contributes to the capacity for flourishing in academics, and beyond that, in life, in a number of ways. First, the faculty of Odyssey create and sustain a supportive educational environment, which gives students the confidence to explore, dream, and develop their own ideas. Second, Odyssey students will be accustomed to 'thinking outside of the box.' Most important, Odyssey nurtures creativity. Students are encouraged to be open-minded, yet intellectually humble. They are encouraged to be rigorous and to persevere in learning, yet to love learning and to be creative in the course of pursuing their dreams. Mentoring is at the heart of everything we do at Odyssey Leadership Academy. The moral center of OLA revolves around the idea that, in order to educate fully flourishing human beings, there must be people who speak life into one another in a caring community. We take our cue from the great philosophical and religious communities who devoted themselves to caring for one another in wisdom, truth, and love over long periods of time, including Plato's Academy, Aristotle's Lyceum, and the early Judeo-Christian communities who practiced charity, hospitality, and sacrificial living. At Odyssey Leadership Academy, mentoring happens in all spaces: eating together around the lunch table, playing ultimate frisbee at the park, sipping cappuccinos in coffee shops, helping each other rappel down a mountain, sitting around a campfire at 13,000 feet, teaching guitar... yes, everywhere! Our Mentors walk with a small number of students from the student's first day at OLA to their last. Each Mentor is responsible for mentoring students of the same gender, beginning with the student's first year. As the student moves up, so does the Mentor. A Mentor is not just a teacher. He or she is helping to shape Odyssey Expeditions, leading Odyssey Explorations, advising students on course selection, getting to know the needs of each student's family, helping out with college advising, and being there to offer encouragement and support throughout the student's journey. We also believe in fostering a spirit of mentorship in our students by asking older students to mentor younger students both one-on-one and in small groups. Miss Kingston and her mentor girls posing together in Central Park, during the 2017 Spring Excursion. We structure our class times as a journey undertaken with one's peers in order to discover, create, and explore new things. EACH SCHOOL year is broken up into Four course BLOCKS. What are course blocks? We offer four terms of eight-week courses that allow students to dig deep into one particular conversation. This means that students are only focusing on learning one topic for those eight weeks instead of the seven subjects taught in traditional school settings. This provides students the chance to go deeper, ask questions, pause for reflection, and cover more material in one unit than most traditional students would cover in a whole semester. Each course meets from 9:30am - 12:00pm every day for eight weeks (it is highly encouraged and expected that the time is spent in a variety of ways: interactive conversation, lecture, small group work, outdoor exploration, reading time, workshops, acting, etc...). Once a student chooses a particular course, the student is engaged in that course for the duration of the eight weeks. Student, Julian, talking about his Celebrating Differences course final project with Celebrations of Learning attendees, Fall 2017.
and Eichmann in Jerusalem, by Hannah Arendt (to name a few). The students at OLA will be well prepared heading into college. They know how to research very well, they know how to write papers, they know how to cross over different subjects to discover real life solutions to real life problems. Their hard work and skills developed in high school will pay off immensely at the college level. Odyssey students would fit well in our honors college because we after more meaningful work and that is what I see the students of OLA are getting to experience. Week-long trips created to deepen community and our understanding of the world around us. During the rest of the school year, students will have the opportunity to go on two more excursions (one in the fall and one in the spring semesters). These times of travel give students cultural exposure and leadership experiences beyond the classroom. Past fall and spring Excursions have been to New York City, the Cochiti Indian reservation in New Mexico, Washington D.C., Chicago, Colonial Williamsburg, Selma, Birmingham, Yorktown, Vicksburg, and the Grand Canyon. True community is built when lives are shared all day, multiple days on end. During the year, students and faculty embark on three, week-long trips. Each year holds different destinations because we try to match what we are learning in our morning courses with where and what we see and do on our trips. Our first day of school is the day we head out on our first trip. Typically, this looks like engaging in activities and experiences in the mountains and on the rivers of Colorado. This allows for student-to-student and student-to-mentor bonding, creates deep relational connections, build bridges between ages, and starts the year off with a life-changing experience that sets the tone for the rest of the year! 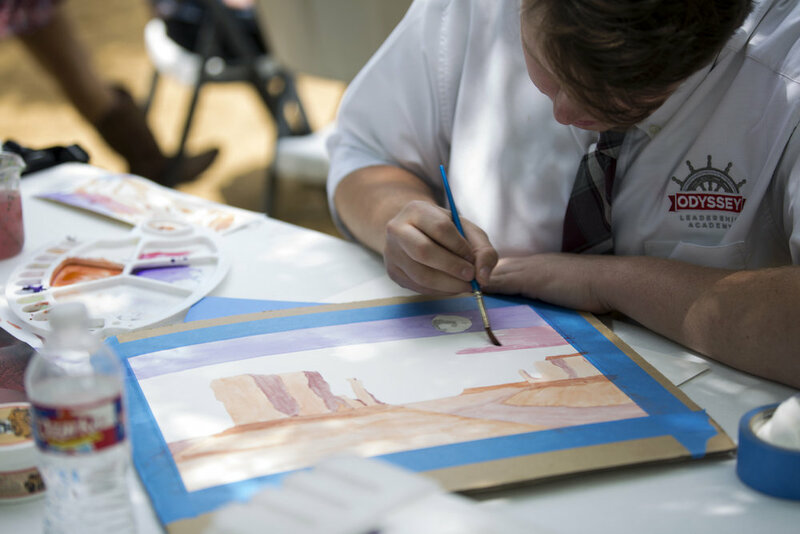 Student, Harrison, painting live for his art expedition's final project, at Celebrations of Learning Spring 2017. At Odyssey Leadership Academy, we help students craft their own educational journey to fit their passions, interests, needs, and desires. Odyssey Expeditions meet in the afternoon from 1:00--3:00 pm, Tuesday - Friday, with Mondays serving as Service Leadership. Students have the chance to engage in our diverse selection of courses guided by our Mentors, or design their own educational experience during these afternoon sessions.